Pixie Dust Healing: Solar Flares and Temper Flares? It has been a busy few days in my part of the world and I've been witness to some pretty intense encounters. I've seen tempers really flare up in unusual places and situations it would seem. I've seen this happen in business meetings, between friends, between co-workers and among strangers. It hasn't just been in my part of the world. There have been media reports of armed police needed to intervene as people fought over the ability to buy new shoes at a cost of a couple of hundred dollars! Strikes abound with no end in sight and lots of damage incurred. And international tensions continue to escalate in many parts of the world. The only commonality between all these events seems to be in the level of intensity. Some of the encounters I have personally seen have left me speechless- and believe me- that's unusual! Maybe all this is just a "sign of the times", coincidental, or "that kind of week", but when I see trends like that I like to dig a bit and see if there might be an explanation beyond the obvious. The New Moon was in Pisces, so I guess that could contribute to the flowing emotions. But personally, I've seen a whole lot more fire than water, so I'm not convinced that's it. We are in a period of pretty intense solar flares. I've written about solar flares before http://pixiedusthealing.blogspot.com/2011/02/full-moon-in-leo-solar-flares-and.html They do seem to have affects on us. They change the ionization, that means changes in our atmosphere and how could that not on some level affect us. The Global Coherence Initiative reports that solar activity has been scientifically linked to increased violence, homicide, suicide, heart attacks, strokes, depression, fatigue and irritability www.glcoherence.org/monitoring-sstem/commentaries.html Well, I guess that explains some of what I've seen. But not only is there scientifically evidence of these affects, this information was first discovered by the Russian scientist Tchievsky in 1916! So it's not as though this is anything really new to us. And yet these actions and reactions seem a bit "new" or different to me. It has occurred to me to wonder which actually comes first. 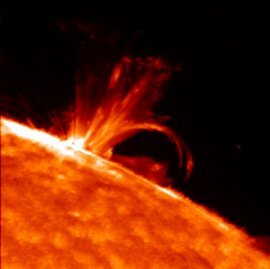 Is it the solar flares that tweak us humans just a bit so that react in outward, and inward, displays of unrest and energy? Or is the universe responding to our intense energy outpourings by releasing solar flares? Solar flares are a release of energy. Maybe the universe is saying "Whoa there you guys! You're getting a little crazy down there. We're going to have to loosen the tap just a bit to balance out all that stuff you're willy nilly throwing around down there. We can't have all that energy just floating out there without releasing something to find a balance." Maybe it doesn't matter which action comes first. For every action there is a reaction- isn't that the most basic premise? This week has been a pretty busy one for Bach Consultations. http://pixiedusthealing.blogspot.com/2011/04/bach-flower-consultations-getting.html People seem to suddenly be feeling the need to find emotional balance in these intense times. There is even an intensity to the remedies these days. People aren't just shedding superficial layers like Beech for some mild irrationality or Mustard for gloom with no known origin. People appear to know very much what they want to shed and I'm talking about real transformative stuff like lots and lots of Cherry Plum for the fear of loosing control, and Gorse for true hopelessness and despair. Lots of Holly is going out the door these days as people look for that catalyst to change old patterns, habits, and deep seated insecurities. People are looking for, and finding, change. I think that's the point, and I believe that's the way to use this type of energy for good. So maybe we really are in a period of change. Perhaps new patterns of interactions really are starting to develop. Or at least, old ones are dying out. I think that's what evolution is all about. I think that's the way to create a better world, a better life, and a new way of being. I believe the first step to internal change is being able to acknowledge and balance our emotions and if it takes solar flares to do that, bring them on. And if we are creating the solar flares by throwing that stuff out there- to the universe I say, "thanks for the release". Together we move on.